Cathy and I had just arrived at the Parent House in Cincinnati, and had barely said hello, but Boun Lod was busting to ask the question. We hadn’t seen her for a number of months, and we were pleased that she had enjoyed school in Philadelphia so much that getting back to class was at the top of her mind. We were also surprised, and impressed, by how much her English had improved. We had arrived in Cincinnati late the night before to be there for Boun Lod’s surgery that was scheduled for the next day. Boun Lod’s last surgery was on her face and lip, and Boun Lod and Noi had been staying with relatives in Philadelphia while Boun Lod recovered. While in Philadelphia, Boun Lod went to occupational therapy at the Philadelphia Shriners hospital to work on the use of her prosthetic arms. Boun Lod also went to Moonstone Preschool, and apparently loved every minute of it. Boun Lod and her mother returned to Cincinnati on July 11. During the months she was in Philadelphia, Boun Lod had healed well, and the surgeons in Cincinnati were pleased with her progress. 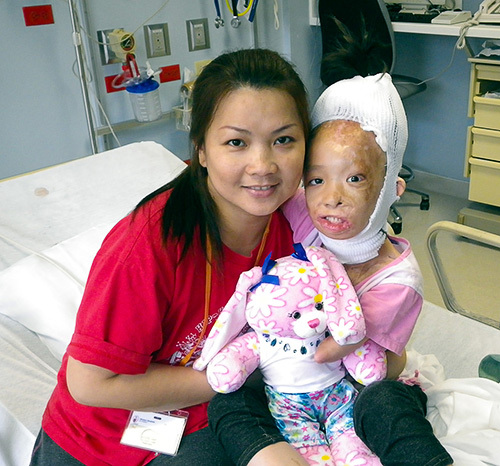 A couple of days after her return to Cincinnati, Boun Lod had surgery to implant a “balloon” under her scalp. Over the next couple of months, the balloon will be injected with saline to slowly stretch the scalp. Once Boun Lod’s scalp has stretched sufficiently, the surgeons will cut it and move her hair forward, giving her a normal hairline. 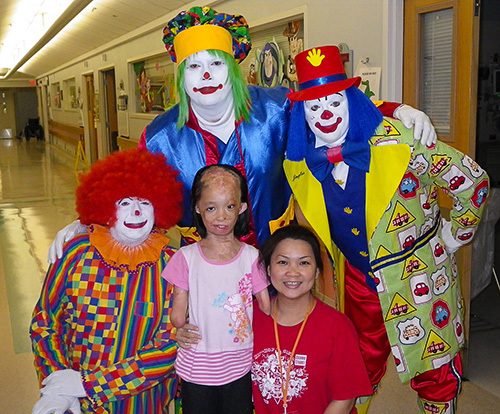 Boun Lod wasn’t crazy about the idea of having a balloon implanted under her scalp but rounds of “Uno”, video games, and a visit from a group of clowns the day after her surgery were great distractions. To allow the Shriners Hospital medical staff to administer and monitor the saline injections, and to allow them to closely monitor Boun Lod’s progress, Boun Lod and Noi will stay in Cincinnati until after Boun Lod’s next operation. The doctors will see how Boun Lod does, and how she heals, before deciding what surgery and treatment should come next. By all accounts, Boun Lod and her mother have been doing well since July’s surgery. Boun Lod goes to school at the hospital, and attends the “Child Life” program daily. Noi has been participating in the weekly parent group. Still, Boun Lod and Noi have been away from home for a long time, and they’re both anxious to return to family and friends. This entry was posted on August 15, 2012 at 2:13 pm and is filed under Uncategorized. You can follow any responses to this entry through the RSS 2.0 feed. You can leave a response, or trackback from your own site.